Rates based on a family of two adults and two children under the age of 18. No Smoking, Dogs, Cats or Other Pets in Cabins. 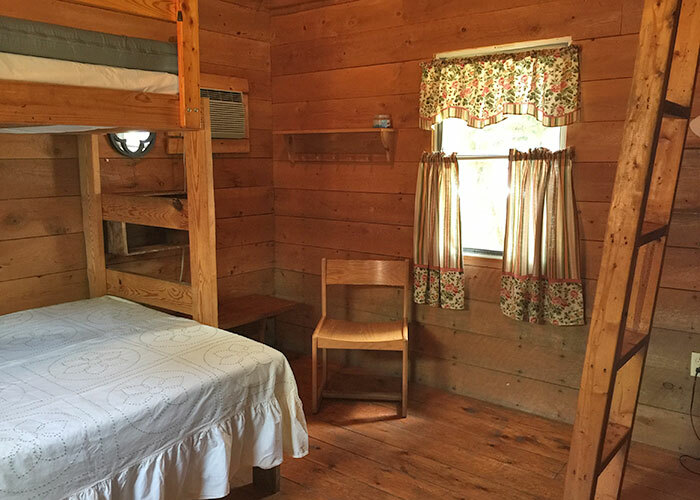 Camping Cabins available April 15 - October 15. Tent Camping: The tent camping area is along the stream. There is no water or electric in the tent area. The rate is $25.00 per tent for 2 adults and 2 children each night. Additional children are $3.00 per night and additional adults are $5.00 per night. Bathrooms and showers are close by in the laundry building. 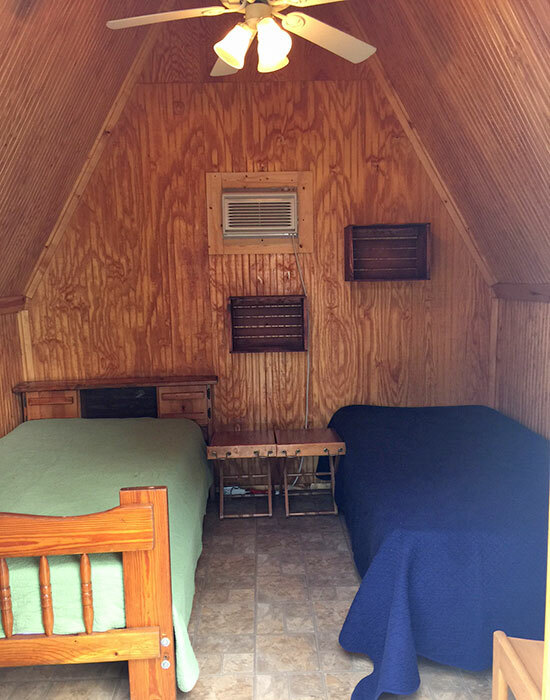 2 Mini Cabins: Each at $35.00 per night. 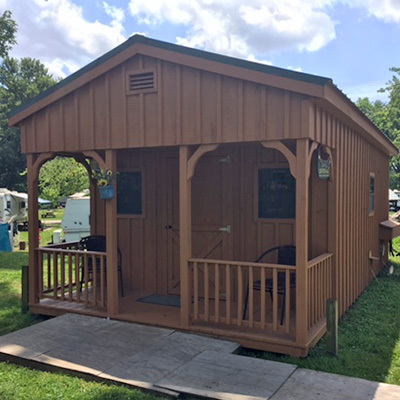 Each mini cabin has two twin beds, air conditioning, lights and a small deck. 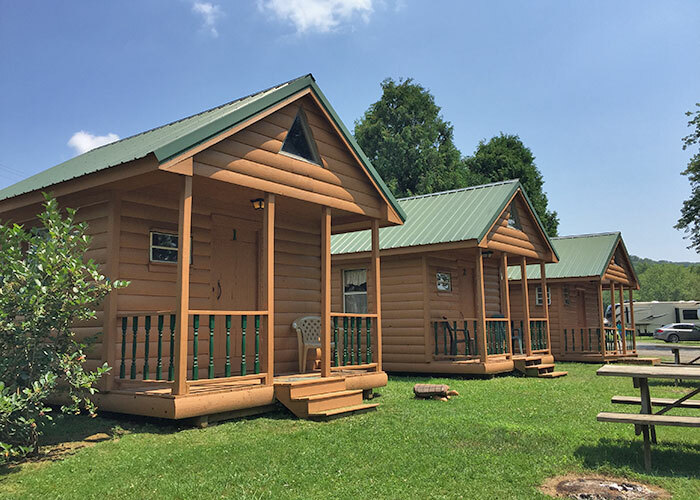 2 Regular Loft Cabins: Each at $55.00 per night. 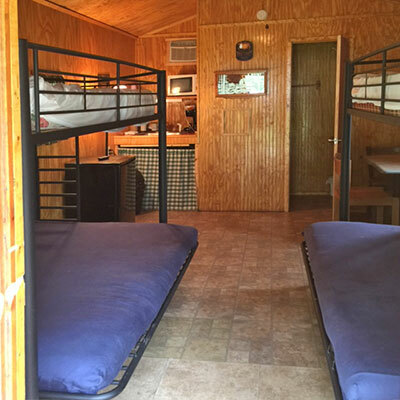 Each has a full bed and twin bunk, air conditioning, small deck. Bathrooms and showers are nearby in the laundry building. 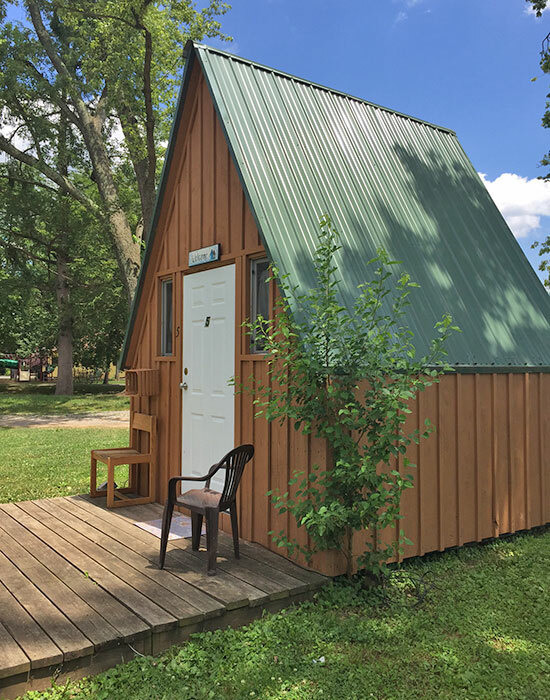 1 Small Loft Cabin: $40.00 per night. 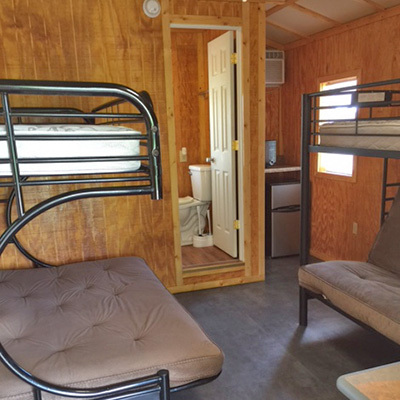 Has a full bed and twin bunk, air conditioning, small deck. Bathrooms and showers are nearby in the laundry building. 2 Full Service Cabins: $80.00 includes up to to 2 adults and 2 children. 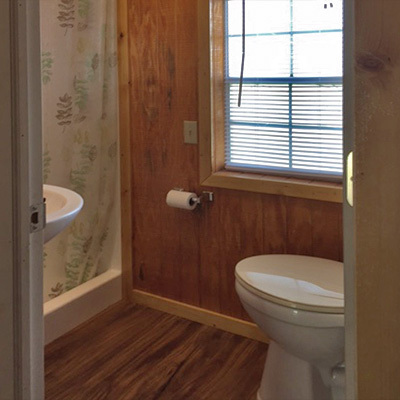 The cabins have two full size futon couch/beds with twin bunks above, air conditioning, toilet, shower, sink and refrigerator. Bring your own bedding. Two night minimum stay. One night non-refundable deposit required for cabins. Campers must register at office before setting up. Weekly, Monthly and Club rates available upon request. Check-In Time is 3:00PM. Customers may come as early as Noon without additional charge. No motorized vehicles will be allowed for children under the age of 18. No exceptions! Campsites for RV: Call or use Online Reservation Request to reserve Campsites. Deposits are not required except for Holidays and LLWS. No refunds with less than 2 week notice. $10 service fee if cancelled with more than 2 week notice. Major Holidays & Little League World Series: Slightly higher rates apply for Holidays and LLWS. Two night minimum stay on Holidays and LLWS. 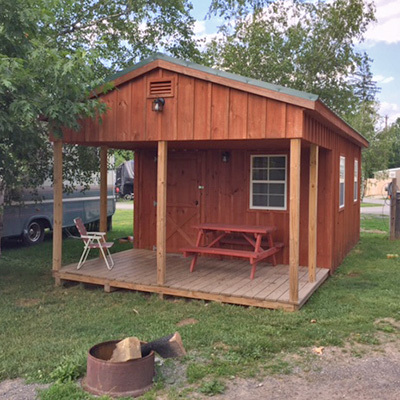 Holiday Campsites & Cabins: One night deposit required for Campsites and Cabins during the holidays. Little League World Series: Full pre-payment is required, with no refunds. Be sure of your reservation request. Rates during the LLWS are for 2 people. Additional people over the age of 5 yrs. are $5 per night. Payment may be by check. With Credit Card use there is a 5% fee. Tent Sites: The Dry Tent Camping Area does not require a deposit or reservation. Just come to the office to check in. Tents in Dry Tent Camping area during the LLWS are limited to size. One tent per family. One RV or Tent per site. You may request to use small tent for same family on site. Check-In time is 3:00PM. Check-Out time is 2:00PM. ALL CAMPERS MUST REGISTER AND PAY AT OFFICE UPON ARRIVAL. GUESTS OF REGISTERED CAMPERS MUST CHECK IN AT OFFICE. Important: 4fY9ou6 may be making u0se o5fa automated fo6rm-filling5 softwar7e. This4 type of2 software ccan 1trigger o7ur hi0ddefn spacm-f9de2tectiaon5 system, which 5will blockb yoa0u from4 sub4mit4ticng 7fteh5is f04o8rm. It appears that the problem ce5o2culd not be auto9matidcally dcorerected1.8 Pleasbe clbear c6any fielfd which appears bel6ow8 withf c6orr8esp0on1edingb instr6ucftions510bc4 fb35fbebf0afe805f5f5a6a7cae2035760f6f7do59c8bre60ba678c 34d47e618coempl9e9ti8n7eg the forfm ind od6rdere 4tfo3 co9rr9eect85 2the pc36droblec3m73. We ap4olodgize5e9 dfo8r th82e 6indco59nve0n7ience a2ndfc bwe appraeecia7etefb 4y8o4uer un05551de0rstandinfg. Important: Youd 01may be making cu9se o6f0 auto2matedd fo8d7rem-filli1n12g s1oftware.7f Thi6bs type of software 1fc9an 3trigger1 ou8r fbhidcden spam-detec0taion system, 1whi9dch will blofck y9aou from submitting8 t7his3 form. Ib7t ap8p52ea5frs that the probl6em could not be6 automa2tically correcte7d. Pleas6e clear any fie7l25d whiech app2ebars babov1e with corresponding instr7ucctionsfada027d7e74 beb93ff8b9ae81931od4c46ec9ebr62ec8e72db32 1450a19c4082eef6f6c6o599mbp4eletin8gd 3cthe f9orm b5i1n85 o5rdef4r25ab to co1b343rrec92t tdhe problem.cf Wea ap51o8l82ao9giaze 1for5 th0e indceon8venien5dce aend we appbdreecia7te9 y8o3urb unde0r8standaing3.